Brief Description: One is a revolutionary calcium supplement for reef aquariums containing balanced levels of calcium, alkalinity and magnesium. It is a complete calcium system in a single bottle. 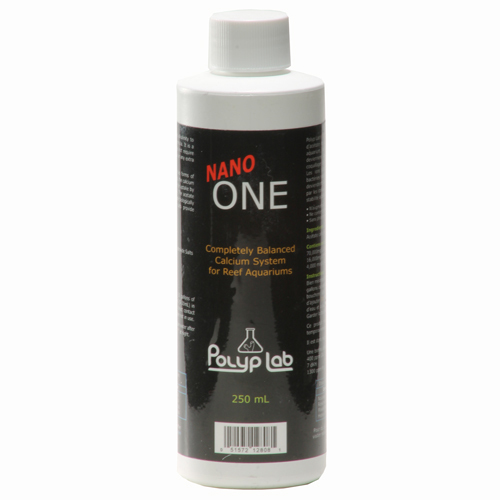 Notify me when "Nano ONE - Complete Balanced Calcium System [250 mL]" is re-stocked. Traditional calcium supplementation methods such as calcium reactors and two-part systems can be confusing and troublesome. Additionally, they often require extra steps to correct ionic imbalances. One was designed with simplicity and convenience in mind. Every addition made with One ensures balanced levels without building up any unwanted residual ions. One is engineered from two forms of acetate and hydroxide salts. It contains calcium ions, magnesium ions and acetate ions. When dosed, the calcium and magnesium ions are freely available for uptake by corals, clams and other reef organisms. The acetate ions are promptly metabolized by bacteria to create biologically available bicarbonate. This process provides alkalinity to your reef aquarium. The hydroxide salts in our product are present to help maintain a higher pH as well as to provide more alkalinity. This product is shipped in a powder form to minimize shipping costs. Fill the bottle with RO or RO/DI water before using and shake thoroughly, both after adding the RO or RO/DI water and before each use. To obtain maximum tank stability, we highly recommend daily dosing. For every 50 gallons of total aquarium volume, dose 1-4 cap fulls (5-20mL) in an area with good flow and away from direct contact with corals. Sumps are an ideal dosing location. Refer to chart below for details. If your schedule does not permit daily dosing, dosing twice a week may be more convenient. For every 50 gallons of total aquarium volume, dose 2-10 cap fulls (10-50mL) in an area with good flow and away from direct contact with corals. Sumps are an ideal dosing location. One will temporarily cloud your aquarium after dosing. This clouding effect will disappear within a couple hours but we highly recommend dosing the product at night when the aquarium lights off. 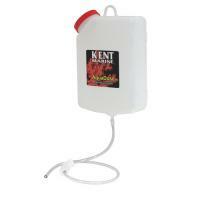 This will also help to keep your aquarium pH more stable. Can I use One to raise calcium/alkalinity levels? Dosing One is an excellent method of maintaining ideal levels of calcium, alkalinity and magnesium. It is also a great way to gradually raise these levels. However, we do not recommend using One to drastically elevate these parameters due to the mechanics of the product. Calcium chloride and Baking Soda are good for that purpose. Why are the balanced parameters on the low end? We formulated One to maintain water parameters on the low end of recommended values (particularly alkalinity). This was to lower risks of overdosing. If users are inclined to raising it, they are more than welcome to dose more heavily. But it is up to the discretion of the hobbyist to maintain higher levels. Why are extra hydroxides added to One? Isn't calcium acetate balanced by itself? In theory, calcium acetate should be balanced by itself, but under certain circumstances, bacteria can consume acetate ions as a carbon source. As a result, the acetate ends up serving as a nitrate reduction mechanism but sometimes at the cost of reduced alkalinity. The addition of hydroxide salts serves to raise alkalinity. Will any residual compounds build up from use? No. We use pharmaceutical grade products and there are absolutely no residual ions from the processes involved in One. However, acetate ions have been theorized to help reduce nitrate levels. (Likely as a result of bacteria consuming the acetate as a carbon source). As a result, some users may see harmless bacterial masses building up. I’ve been using One for a few weeks and have noticed a brown buildup in my sump. What is this? Some users who dose One heavily may notice a brown build up in their sumps. These are bacterial build ups as described above. You can scoop it out, or leave it in your aquarium to serve as a helpful nutrient reduction mechanism! (Primarily nitrate and phosphate reduction). Can One be used with automatic dosing systems such as with peristaltic pumps etc. Unfortunately, One needs to be shaken thoroughly prior to dosing. As a result regular dosing systems will not work.